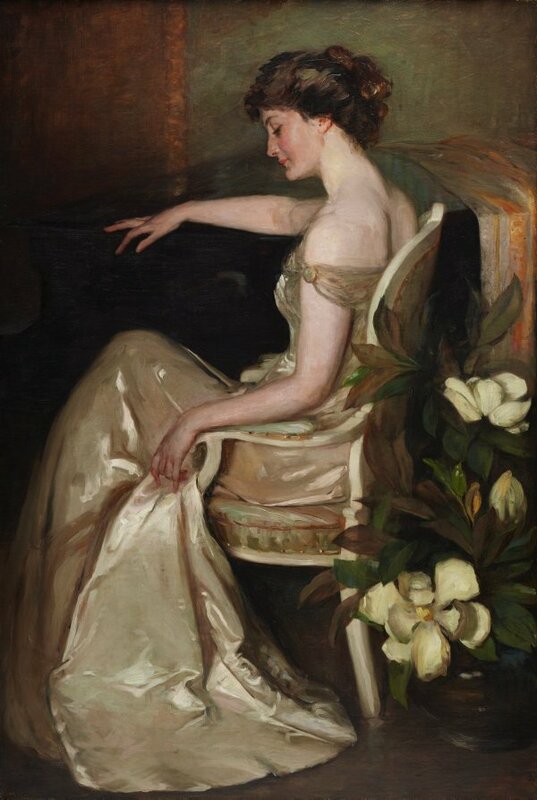 Violet Teague achieved recognition as a fashionable portrait painter in the early 1900s, having studied in Brussels, London and Melbourne. Her painting 'Dian dreams' is an assured study, on a grand scale, of Mrs Una Falkiner, a famous beauty of her time and a student at the National Gallery of Victoria Art School. The work constructs a quintessentially female world, in line with approved roles for women of the period, and yet it is larger than this in its unusual profile view of an entirely confident and sophisticated woman for whom the spectator is virtually irrelevant. It was awarded a bronze medal at the Panama Pacific exhibition in San Francisco in 1915. Teague is also recognised for her Japanese style prints depicting the Australian bush. Signed and dated l.r. corner, brown oil "Violet Teague 1909".